A Monreith resident who is recovering from breast cancer was devastated last week when her home, along with five other properties in the village, was flooded. Margaret Stuart, of The Neuk, was told by her consultant to avoid stress after finishing radiotherapy treatment before Christmas, but she now has to deal with her home being ruined by water damage. With no history of flooding before, residents in the village allege that the new Dumfries and Galloway Housing Partnership (DGHP) development, built behind many of the homes affected, has caused the flooding after the drainage system was altered. As well as Margaret and the holiday home next door, her neighbour June Lochhead at Glen Roy House was flooded, as were Alison and Peter Salmon at Mill House and Anne Walker at The Cottage, Mill Lane. The village Hall was also affected. June Lochhead said: “I remember filling in an insurance form recently and I was asked if we were affected by flooding and I laughed – as if we get flooding in Monreith. Something has gone badly wrong. But here we are.” The residents have now had the expense of buying floodgates and have got together to reinstate a ditch behind the homes on the main street that they claim was filled in during the construction of the 13 DGHP houses. A statement from the Monreith and District Action Group (MADAG) said: “Following heavy rain in the area, considerable flooding occurred to several houses on the main road and two more on the road to St Medans, including the village hall. “The farm fields to the north of the village are considerably higher than the houses and water has always run down from there in times of heavy rain. The recent new DGHP housing development at St Medans has altered the flow of water and the accompanying drainage system was unable to cope with the increased flow. This resulted in six houses and the village hall experiencing flooding. 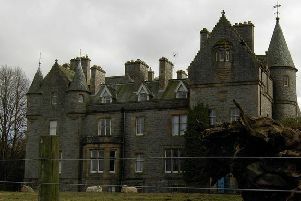 “MADAG had several meetings with DGHP, Dumfries & Galloway Small Communities Housing Trust, Asher Associates (drainage consultants), SEPA and Scottish Water in 2014 and our concerns were raised regarding the large amounts of water that would be entering the site from the elevated farm fields at times of heavy rain. We were told that all parties were satisfied with the planned new drainage scheme for both foul and surface water to be installed across the site and that this would be adequate. Both MADAG and the villagers concerned are now very disappointed to have been proved right. The rainfall over the past week has been high but we would like to point out that Monreith Burn is still 0.5m below its high level mark, so excessive rainfall alone cannot be blamed for the flooding events. A Dumfries and Galloway Housing Partnership (DGHP) spokesman said: “Whilst we fully sympathise with the residents in Monreith we want to be absolutely clear that the flooding has not been as a direct result of our properties being built on-site. The report went on to say that flooding to the properties fronting the A747 was caused by a build-up of water along the southern site boundary from the drainage ditch (running along the east boundary) which in turn burst through to properties below. A DGHP spokesman added: “As residents will appreciate, these events were entirely outwith DGHP’s control and within land not owned by DGHP. Indeed, flooding would have occurred irrespective of DGHP’s houses as has been the case historically.